The Dave Rayner fund have backed my whole U23 campaign thus far. This will be my third season with their support. I have spent the previous two seasons on an American team, before making the jump back into Europe at the tail end of last year. I join the men in green, An Post CRC. Cycling legend Sean Kelly and General Manager Kurt Bogaerts are the brains behind the operation. Over the years it's become a staple part of the European peloton. Registered in Ireland but with strong links to Belgium. The next few months will mostly be tackling cobbles and wind in the Belgian and French early season classics. 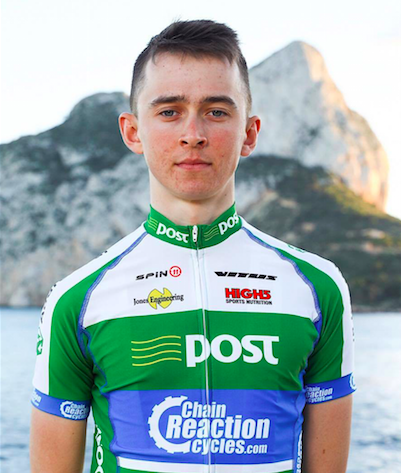 Then we'll get stuck into some stage races like the Anpost Ras in May. The calendar is second to none, a huge variety and volume of class races. We ride bikes from Vitus, just like Sean Kelly during his career. So there's no uncertainty that they can win races! The kit is supplied by Spin11 out of Ireland. Do you have any other interests outside of cycling? I get a real thrill out of being thrown into different cultures. Hopefully I can pick up some Flemish this year! Without eating too many frites.